Italian Meatloaf with Jalapeno Balsamic Glaze | Cooking Wine And Travel - The site where Foodies Unite! This dish is a fusion of my Italian meatballs and a spicy Jalape�o reduction sauce that I created for my wife, Karen, who likes everything spicy. This is also the favorite dish of my daughter- in-law, Nicole, who is a vegetarian. For Nicole´s dish, I replace the ground meat with two cups of well cooked black beans and 1⁄2 cup of rolled oats (not instant). It is another dish that is great for entertaining because you can prep it early and it will keep well in a warming drawer or an oven with low temperature. In a large pre-heated pan over medium to high heat, add olive oil. Then add onions and saute until brown (about 3-5 minutes), then add mushrooms and garlic. Cook 5 additional minutes. Deglaze with vermouth and cook until wine reduces (about 2-3 minutes). Stir in cream, parsley, oregano, thyme, and lemon zest. Cook 5 minutes. 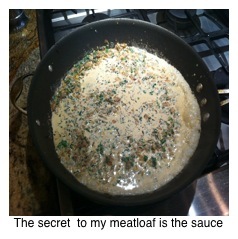 In a large bowl, mix in meats, bread crumbs, eggs, and add the onion and mushroom sauce. Take a bread-sized baking pan and line bottom and sides with bacon, allowing bacon to overlap edges enough to cover loaf. Add meat mixture and fold bacon ends over the mixture to enclose it completely. Cover pan with aluminum foil. Set pan in a larger roasting pan full of boiling water, then cover roasting pan with foil. Bake in oven for 1 hour, then remove foil and coat meat with the Jalapeno Balsamic Wine reduction sauce. Return pan and cook 30 additional minutes. Remove and let stand for at least 10 minutes. Carefully remove loaf and coat with remaining Jalapeno Balsamic reduction. Slice and serve with caramelized onions and mashed potatoes.